They’re back! And with a cracking first episode, as well. No sign at all of budget cuts here, or in the series teaser at the start of the show. The highlight, of course, was the supposed genuine revealing of The Stig. I think it is safe to assume that the person revealed may well have taken Stig duties for this episode. But that is all. 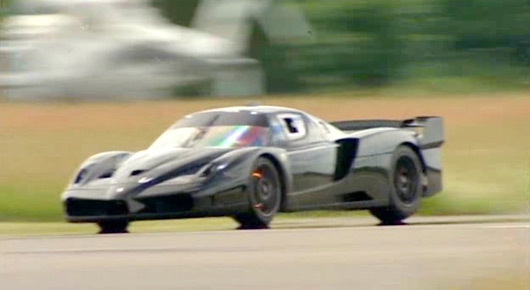 Presumably he, or rather, Michael Schumacher, owns the Ferrari FXX that was featured on the show. Judging by the power lap time set (I won’t spoil it, but it is remarkable) it certainly appeared to be a Schumacher-esque performance. Actually, something that wasn’t a Schumacher-esque performance was his interview with Jeremy. Sure, Schumi’s driving ability sets him apart from his modern day peers, but we saw more personality in a few minutes with Jez than we did in his entire F1 career. Maybe he’s not such a bad bloke after all. The main feature was the London-Edinburgh race. Theoretically set in 1949 the boys took the roads, and tracks, with icons of their era—Richard riding a Vincent Black Shadow, James was in a Jaguar XK 120 and Jeremy in a majestic Peppercorn A1 steam engine. The winner was both unexpected and obvious at the same time. If you follow me. In the middle of all that Jeremy tested a new Lotus Evora and gave it a very big thumbs up. The News section looks to be as entertaining as always, too. Great to have them back! ~ by Rud3Boy89 on June 25, 2009.